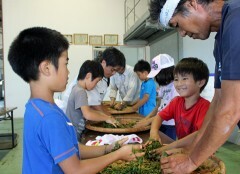 Eleven pupils of Nago City Inada Elementary School picked tea in the tea garden at Goga on July 5. Staff of the Tea Producers Association of the JA Okinawa showed the pupils what to do. The children enjoyed making tea using traditional methods and hoped that it would taste nice. The association organizes for them to pick tea each year to help let local children know about the tea of the area. The tea the pupils picked is a brand named Meiroku that has a reputation for good taste and bright color. The pupils made the tea by repeatedly kneading the leaves and roasting them in a cauldron.